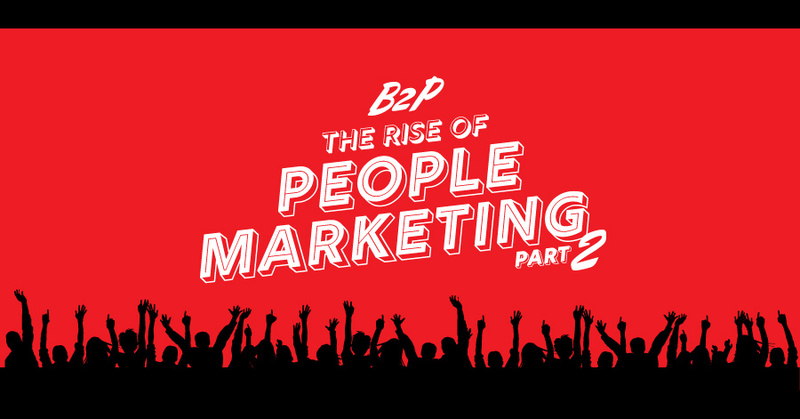 Welcome back to Part Two of our ‘B2P, the future of marketing’ series. If you missed Part One, STOP RIGHT THERE and click here, as our first blog is handy for getting the 411 on what we mean by the newly coined phrase of ‘business to people marketing’. Read part one? Good – please continue. In today’s second and final part, we delve a little deeper to reveal more of B2P marketing’s defining features. Not all marketing moves need to be as daring (refer to Nike in part one) – in fact, for clarity, sharing any kind of political opinion as a business online should always be approached with caution. However, more brands are choosing to take an online ethical stand to appeal to the personal ethics of their customers, especially when they can show they are outperforming their competitors. For example, for cosmetics company Lush, protesting against animal testing is at the very core of its business strategy, as it emphasises its position as an animal-friendly brand to appeal directly to people who share its views. And, crucially, there is evidence that the next generation of consumers are likely to be more concerned about brand ethics than ever before. In a recent MediaCom study, two thirds of teenagers said that they were more likely to buy from brands that supported the same causes they did (1). Brands need to remember that teenagers will not only grow up to be personal consumers, but also CEOs and leaders who will be important decision-makers. Aligned political and ethical beliefs help to build trust between the consumer and the brand initially, but will also strengthen brand loyalty in the long-term. “With great power, comes great responsibility.” – Uncle Ben Parker, Spiderman. Technology is that power – businesses can now communicate directly with to their audiences and is an incredible gift to marketers, but ONLY if it’s used correctly. Just because social media is free and publishing a post is ‘easy’, that doesn’t mean that anyone in the business should be let loose on Twitter. Want proof? See @realDonaldTrump for compelling evidence that just because someone CAN tweet, it doesn’t mean they SHOULD. This is especially applicable in a digital marketing context; for social media marketing to be effective, it requires skill, knowledge and experience. Similarly, writing content for social media is a precise art because it involves conveying the brand message in a limited character count. As with any type of business tool, if it’s used with no training or understanding, there can be disastrous consequences. One wrong move on social media can be a complete PR disaster – the internet is forever! Even if you delete it, chances are, somebody somewhere has probably seen it! Businesses need to ensure each tweet, Facebook status and LinkedIn update is carefully crafted, planned and managed by people with training and experience in the same way as other marketing and PR activities. What do you think of B2P marketing – do you agree it’s the future? Let us know – we are on; Facebook, Twitter, Instagram, & LinkedIn. And if you’re struggling with your marketing strategy, let us help. Get in touch.